Welcome, MacBook! - jxeeno blog. Home Page » Welcome, MacBook! 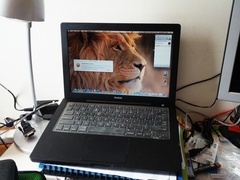 For the past few weeks, apart from welcoming in the busy life of Senior School — I've been welcoming a 2nd hand Early 2008 MacBook (Black) to my family of computers. So, the MacBook is a MacBook4,1 packing a 2.4GHz Intel Core 2 Duo and 4 GB of 667 Mhz DDR2 RAM. Perhaps the second biggest change for me is the lack of the right-click on this model of the Mac. The trackpad features a single-button below a gigantic trackpad (massive difference from the Dell Latitude I was using). I'm stuck with a two-finger tap or Ctrl + Click. The awesome thing is that I basically have everything I used on a daily basis on my Mac. And now, I even have iMovie and Garageband! I do miss one program that I did use quite frequently and that isn't included in Office for Mac — and that is MS Publisher. To overcome this problem, I simply RDP into my Windows laptop to do anything on Publisher. It even automatically scanned for my CUPS Printer shared via my Raspberry Pi. Printer setup has never been easier! The experience has been pretty good so far and I can totally see me using this in the long run — unlike Ubuntu, which is still an amazing operating system but just lacked software.